I’ve decided to break one of my own rules, which is this: Don’t do a story on a place I’ve already written about. It’s a good rule in most cases, but I think there may be grounds for a few exceptions. 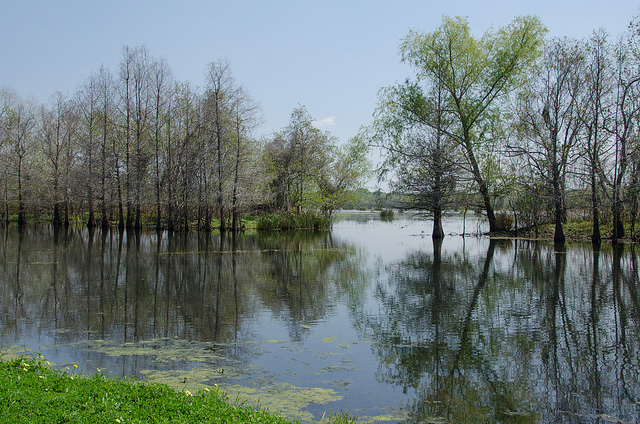 Last year I visited Brazos Bend State Park on March 2. It was a beautiful day in early spring, but a little too early to see the trees covered in green. I knew I would have to return the following spring and, happily, I managed to do exactly that. This year I arrived on March 13, and what a difference it made! Unbeknownst to me, it was butterweed blooming season and I arrived at the most opportune time. If I had seen no animals that day, the long drive would still have been worth it to see the park blanketed in yellow. Butterweed grows to almost two feet tall, the small yellow flowers blooming on branched stems. When they grow along the water, it creates a mirror effect, amplifying the floral display. I know where I’ll be in mid March of 2019. 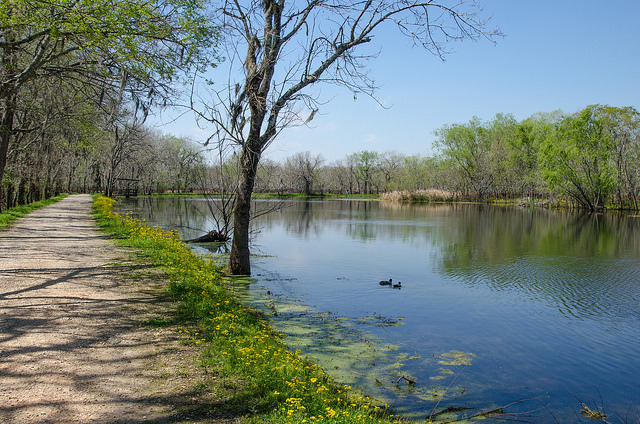 Pretty yellow flowers aside, Brazos Bend is recognized as alligator country. I suspect most visitors to the park arrive in the hope of seeing one of the impressive animals, and they very likely will. At least during the warmer months. 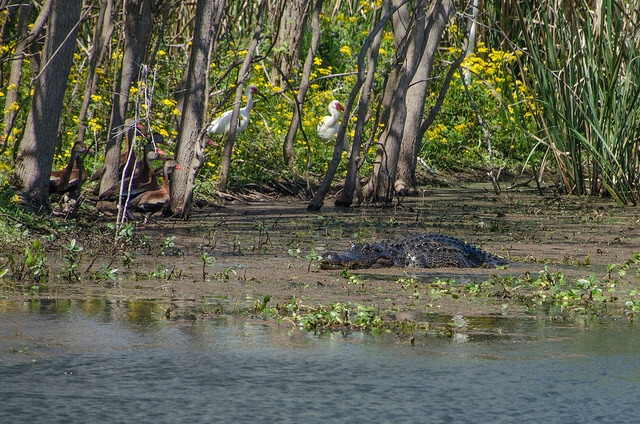 According to the Brazos Bend State Park Volunteer Organization, the park has between 250 and 350 alligators over six feet long. On the day I visited, I saw fifteen of them. Six of which were slumbering just a few feet away from the walking trail. 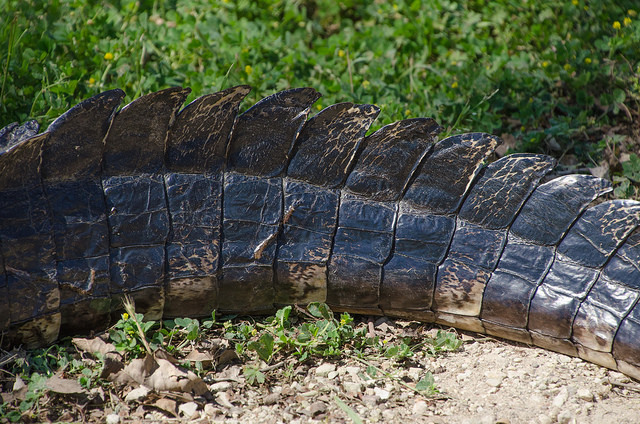 Alligators are talented predators with a toothy appearance that tends to make people a tad bit wobbly kneed. They induce fear but rarely laughter, yet I have to admit to choking down a giggle or two when I encountered them dozing surrounded by dainty wildflowers. Just seemed like an unexpected contrast. The park’s volunteer organization states that alligators breed in April/May and lay their eggs in June. Sixty days later, the babies begin to make some noise, at which time the mother will uncover them and carry the eggs one by one to the waters edge and crack them open. So… I’ll be making my way to Brazos Bend come August, being certain to tread a little more carefully lest the protective mothers feel threatened. 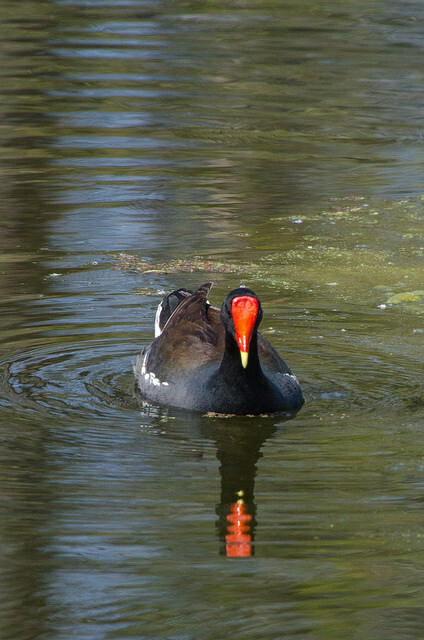 Another of Brazos Bend’s attractions is its impressive variety of birds. 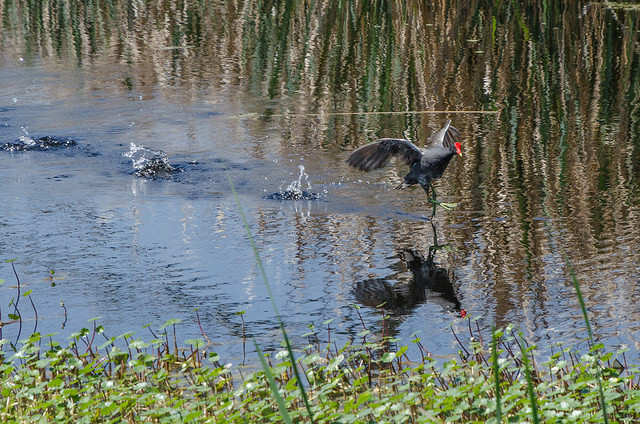 Within the park, 300 species of birds have been documented. I’ll just say that I saw no more than a handful of them, though that may be due to my bird blindness. It’s a thing. At least for me. They can be sitting in a tree right next to me and I’ll still miss them. What I need are birds that don't scare easily and the American white ibis seems to fit the bill. I have no problem locating them and snapping some pictures. 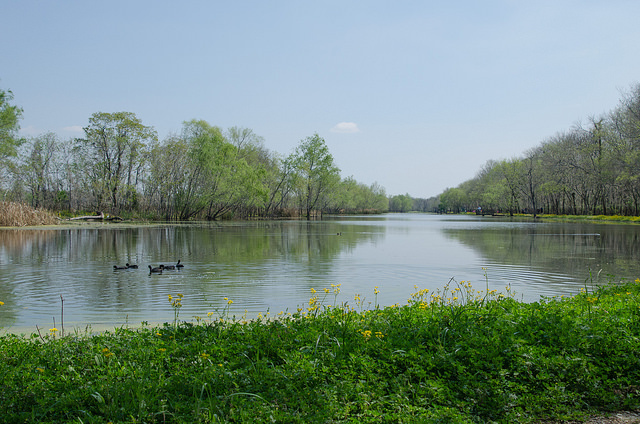 If you live in the Houston area, or are planning a visit, I would encourage you to place Brazos Bend State Park at the top of your list of places to see. It offers a unique opportunity to see wildlife up close.